The Trump administration on Monday announced it would reinstate sanctions on Tehran after the US withdrew from the Iran nuclear deal. Iran has responded to looming sanctions with military threats but backed it up with little action. Iran’s economy is tanking for numerous reasons, but the sanctions could seriously rock the country, which is already seeing massive protests. Iran has its back against a wall and faces economic or military defeat by the US or a humiliating summit with Trump. An expert told Business Insider that Iran could negotiate with the US through Russia to save face. The Trump administration on Monday announced it would reinstate sanctions on Tehran after the US withdrew from the Iran nuclear deal – and Iran has made no shortage of vitriolic threats about what it may do in response. Beginning Tuesday, the US plans to sanction Iran’s central bank, sending a clear message to the US’s European allies: Do business with the US, or do it with Iran, but not both. The US plans to follow up with another round of sanctions in November targeting Iran’s lifeblood: its oil exports. In response to the looming sanctions, Iran has shuffled around its policies regarding foreign currency, fired the head of its central bank, jailed scores of people involved in currency exchange, and made threats to shut down regional oil shipping with military force. It even threatened to destroy everything owned by President Donald Trump. “It’s pretty clear the Iranians are suffering a fair degree of anger over the economy,” Dennis Ross, who has worked on Middle East policy in four US administrations, told reporters on a call set up by the Washington Institute for Near East Policy. Iran’s currency, the rial, has tanked this year, losing about half its value against the dollar. “In the past week, the price of toothpaste has risen three times,” Ross said. He instead pointed to corruption, talent mismanagement, years of isolation from international business standards, the Islamic Revolutionary Guard Corps’ massive role in the economy, and a lack of transparency as proving inhospitable to investment. At the same time, Trump withdrawing from the nuclear deal and reimposing sanctions dealt Iran a huge blow, which will significantly hurt its earning potential and liquidity. Ross said that while China may still buy Iranian oil amid the US sanctions, it could ask for a discount; while India may still buy Iranian oil, it may offer to pay only in rupees. 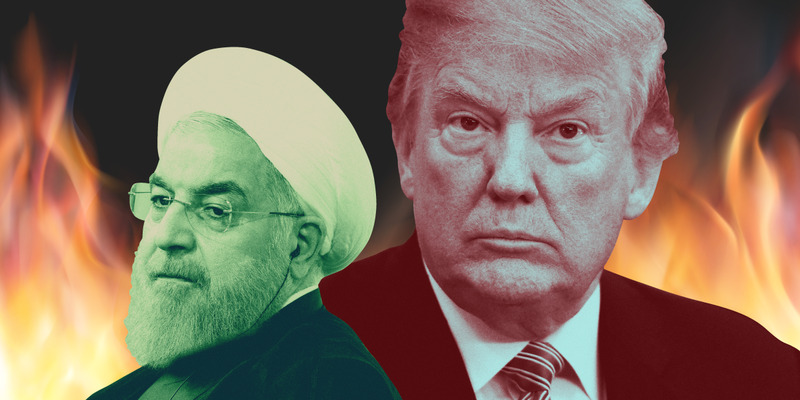 Michael Eisenstadt, an expert on Middle East security and defence, told reporters on the Washington Institute’s call that while Iran had talked a big game, it carefully measured its actions to avoid a strong US response. “Iran faces a dilemma,” Eisenstadt said. “In the past, Iran’s main response was to redouble efforts in the nuclear domain” as a response to US pressure, but Iran has reduced its nuclear infrastructure as part of the nuclear deal with the US and other countries. Iran has made threats to close the Strait of Hormuz, where about 30% of the world’s oil exports pass through, but Eisenstadt and other experts dismissed this as bluster. Instead, Iran could send missiles to its Houthi allies in Yemen to target oil shipping from US allies, as it already has. Iran could attack US troops in Syria. It could detain US citizens, wage a cyberattack, or harass US Navy ships in the Persian Gulf. Iran hasn’t really done any of those things yet. When Iran’s military has lashed out or tested the US in Syria, the US has beaten its forces back emphatically, as has Israel. 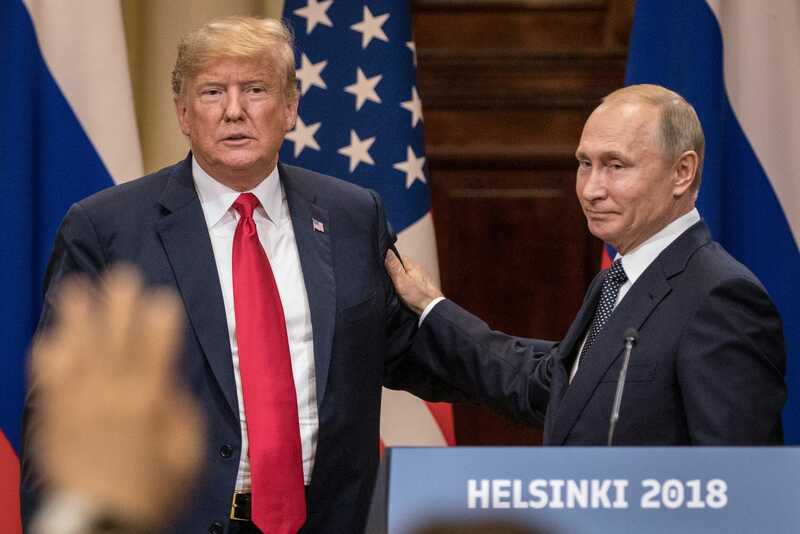 Chris McGrath/Getty ImagesPresident Donald Trump with Russian President Vladimir Putin on July 16 in Helsinki. As Iran finds itself increasingly boxed in by US pressure, Trump has dangled the humiliating prospect of a summit with the country’s leadership. But according to Ross, Iran may have another option: Russia. By dealing through Putin and not Trump, Iran could save face while dealing with Trump’s withdrawal from the deal and its other economic issues.